What a mammoth task these students have taken on! 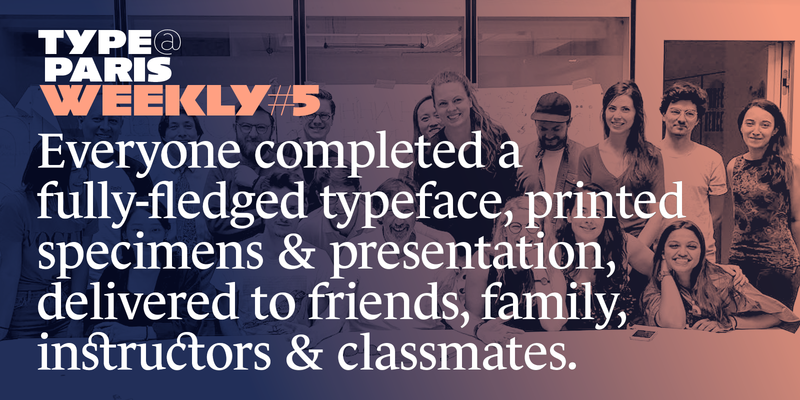 Week #5 was here, and somehow everyone managed to polish and complete not only a fully-fledged typeface, but printed specimens and screen presentations, delivered to friends, family, instructors and classmates on Friday, the final day. The entire TypeParis staff are extremely proud of the efforts of every attendee. The purpose of the first few days of the final week is to take care of the finishing touches of the personal typeface projects, with Thursday as the final deadline for delivery. The visual direction and spirit of each typeface has long since been established, and as work begins on specimens and presentations, the attendees get the opportunity to use their font, and see it from the perspective of the user. Last-minute mistakes are caught, and final improvements are made. The entire TypeParis staff are extremely proud of the efforts of every attendee. On Monday the students had access to a multitude of instructors throughout the day: Jean François, Xavier, Mathieu and Dave—even a visit from a very special guest: David Berlow. David was our final international guest critic. Usually we welcome our guests on Wednesday, however David was generous and spent extra time with the class during his stay in Paris. …as work begins on specimens and presentations, the attendees get the opportunity to use their font, and see it from the perspective of the user. Jean François showed the class some examples of printed specimens and presentations from TypeParis alumni. It was a good opportunity to discuss some dos and don’ts, and to see the process come through in each of them: starting with a brief, sketches, calligraphy, scans, beziers, highlighting visual language, expanding the family, glyph set, in-use. There was a lot of good work, so I’m sure it both inspired and overwhelmed the students! We conducted the group critique sessions on Tuesday, and David was able to get deep into each attendee’s project, and give advice that would transcend the limitations of the 5 week programme, and stay with the students for years to come. The benefit, however, of having the sessions on Tuesday instead of the usual Wednesday, was it gave the class a whole extra day to carry out many of the practical suggestions from David as well. David [gave] advice that would transcend the limitations of the 5 week programme, and stay with the students for years to come. The last TPTalks was a highlight. It was sad to think this was the last one for the summer! Read more and watch the talks here. Thursday rolled around, and everyone was putting the finishing touches on their typeface. We had Marc Rouault back in the classroom, along with Jean François, Mathieu, Xavier, and Dave. The typefaces were due to be handed in at 8pm that evening. Many students exercised great self-control, and wrapped their projects early, choosing to spend time on their specimens and presentations. I relished walking around the classroom and seeing all the typefaces coming to life as they were typeset on the specimen. Friday was the big day! I was impressed at how cool, calm and collected everyone was. The morning was fairly quiet in the classroom, as most people were out printing their specimens. Later, once everyone had filed in, we gathered all the specimens together—which looked fantastic—photographed them, and put them on display out in the foyer, ready to be viewed by visitors arriving the see the presentations. I relished walking around the classroom and seeing all the typefaces coming to life as they were typeset on the specimen. The students put the final touches on their PDFs, saved them all out, and just like that it was time to move into the presentation room! Each presentation was excellent. We were blown away by what the attendees had managed to achieve in 5 short weeks. It was incredibly rewarding for the instructors and students alike to see their work up on the big screen, looking so highly polished. After the presentations, the diploma’s were awarded to each student—some receiving a distinction. You are welcome to view the work of each attendee here. We cheered for each other, hugged, took selfies and group photos, then left for Invalides, for a farewell party on the grass. It was a perfect end to an exciting, intensive and very rewarding 5 weeks. • Subscribe to TypeParis channel.